Happy Friday, friends! It’s Kelsey Barker back again to wrap up our week discussing the HyperDoc inquiry journals I made with my friend and colleague Paige Littlefield. The first page of the inquiry journal features of a Table of Contents. Each day links directly to the corresponding day in the HyperDoc. No matter if students are working on Open or Evaluate, they can easily navigate their journals no matter how long the document ends up being. 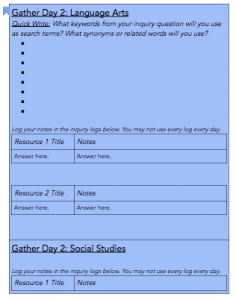 The second section of the inquiry journal features a Resources section, where students can easily find several resources they will use throughout the unit. Below the resources in the Open section. After some trial and error, Paige and I decided it was most efficient to connect the Language Arts and Social Studies activities each day. We built in instructions for every day’s activities right into the journal so that written instructions were right in front of the students as they worked through the process. Thanks to the flexibility of the HyperDoc format, we built inquiry logs, quick write, pair-shares, and exit tickets right into the journal. This made it easy to provide students with the structures they need to be successful while keeping it seamless and easy to navigate. Each day’s activity for each class features starter, work time, and reflection components, based on the session plan from the GID institute. Our school uses Google Classroom, so once this inquiry journal was completed, it was assigned to students through their Language Arts class and then shared with their Social Studies teacher so that everyone could access their work. The final inquiry journal, before students wrote in it, is around 20 pages in length. When I saw that, I knew that we had made the right choice in choosing HyperDocs for inquiry journals. 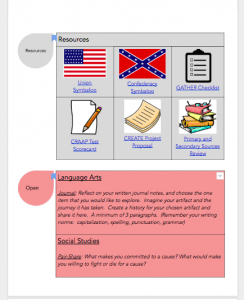 Especially with multiple courses and teachers involved, HyperDocs gave students a common structure that helped them stay organized no matter if they were in Social Studies or Language Arts. Students who were absent were easily able to see what they missed by accessing their inquiry journals from home, and students couldn’t lose their journals or leave them at home accidentally. 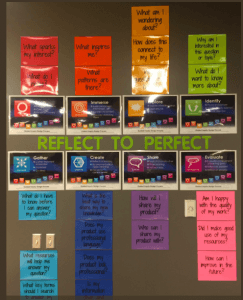 Most importantly, digital journals allowed the entire learning team the ability to check in on a student’s progress at any point during the process, leave feedback, and generally keep tabs on how students were working through the unit. 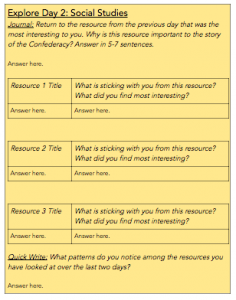 Since this unit, I have used a similar style of HyperDoc inquiry journals with other GID units, including the 6th grade unit we are currently working on. They are easy to customize for each unit, and I appreciate their functionality for all kinds of students. Right now I have to say I’m especially grateful for the “Revision History” feature in Google Docs… that has come in handy as my 6th graders accidentally delete their work! 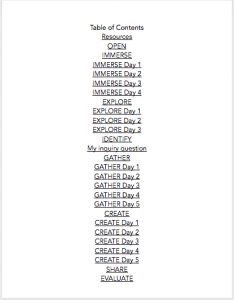 This summer, Paige and I presented at another local conference about our joint HyperDoc endeavor, and I can tell you I’m not the only GID practitioner in our district who is excited about using HyperDoc Inquiry Journals. Between new technology, professional development, and the brain trust of my educator friends, I love to constantly grow and improve my practice… and I hope our story might be useful to growing in your own practice as well! Thanks for following along this week. I’m sure I’ll be back to talk GID with you again soon!